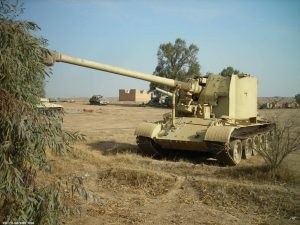 The “T-55/130” is the unofficial name given to a very mysterious SPG that was photographed in Diyala, Iraq, 2007. According to a series of photos, it is simply a 130mm Type 59-1 field gun mounted on a T-55 chassis. However, the exact date of its construction, its location (then and present day), and its history are unclear. There appears to be only one that has been photographed, which may be the sole T-55/130. A likely story has been pieced together using clues such as unit markings – those of MEK (Mojahedin-e-Khalq / People’s Mujahiden of Iran), giving some insight as to its origin. 1. The gun is not a Soviet-built 130mm M-46, as the M-46 has only a single cylinder recuperator above the barrel. Many sources mistakenly believe that the M-46 and Type 59-1 guns are the same, but in actual fact, these are very distinctly different guns. 2. Whilst the wavy-topped gunshield appears typical of a 122mm D-74, these guns were not exported to Iraq. Some were sent to Iran, and it is possible that some were captured by Iraq during the Iran-Iraq War. However, the gun is almost certainly 130mm, not 122mm. The breech block is stamped “130 Gun”, and this is likely a warning to troops not to load 122mm shells. Also, the 122mm D-74 looks very similar to the 130mm Type 59-1, except for the muzzle brake, and according to photos (see comparative photos below), a slightly shorter and narrower barrel (finding exact measurements has been near impossible). Therefore, the gun is not a Soviet-built 122mm D-74. 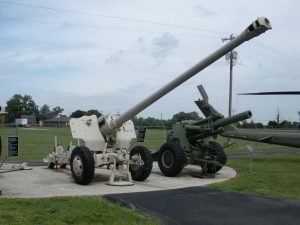 It is also unlikely that this gun is a local production copy/conversion of a D-74, which has been built to 130mm, especially given the time frame of the vehicle’s existence (circa 1988), as local conversion and production of high caliber guns only took place in the early/the mid 1990s. For example, according to “Military Industry and Regional Defense Policy: India, Iraq, and Israel” by Timothy D. Hoyt, Iraq was actually producing the 122mm D-30 under license from Yugoslavia, although this was not until after 1990, and Iraqmilitary.org user “Hawkeye” remarks that these were made between 1994 and 1996, costing barely $300 (USD) each. 3. The gun must, therefore, be a Chinese Type 59-1 (or a similar North Korean copy) – and all of the details of the gun support this. The Type 59-1 was a copy of the Soviet 130mm M-46 with a new double baffle muzzle break combined with a new gun carriage based on the 152mm Type 66’s carriage. The end result looks incredibly similar to the 122mm D-74, save for the muzzle brake and slightly longer and thicker barrel. It seems as though it has a rare type of gunshield which is rarely seen on Type 59-1s. According to one source, due to the apparent crude construction of the gun, it may, in fact, be a North Korean built Type 59-1. This would mean that this particular gun was captured from Iran, as North Korea is not known to have sold arms to Iraq directly, due to North Korea severing relations with Iraq at the outbreak of the war; although it is suggested in a CIA intelligence report from the 1990s that North Korea may have sold arms to Iraq via a third party. Information and photos suitable for comparison of locally produced North Korean guns are, inevitably, hard to find, and therefore no further conclusion can be made. 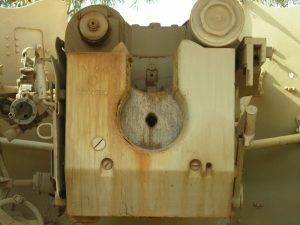 The gunshield has also had a piece sawed off so that the gun can be offset to one side, thus keeping the driver’s hatch clear of any gun mechanisms, as can be seen in the below photo. A new gun turning and stabilization mechanism has been added, to allow the gun to be mounted properly. The rod just in front of this mechanism appears support rod to keep the gun in place whilst driving. Superstructure close up. The gun shield does not appear to be a common Type 59-1 gun shield, but it has been seen on some examples. The gun shield is also clearly modified to be offset to one side – the left side has had a piece taken from it. Behind left is a T-55. Whilst Iraq had T-54s, T-55s, and Type 59s, the chassis is most likely a Polish T-55 LD. By analyzing the road wheels, the first road wheel has a larger hub than the rest – a key indicator of a T-55 or a rebuilt T-54 to the T-55 standard. Further evidence to suggest that it is a T-55 LD are the ‘anti-slap’ brackets under the fenders and tubing on the back of the rear deck. The rest of the design appears fairly crude. The superstructure is most likely for protection against small arms fire – although how effective it would be against a machine gun, especially at a close range, is dubious. According to interior photos, the roof is very crudely welded or riveted together from many plates, although the superstructure does appear to be fairly thick. The roof appears to feature a hatch, probably for an artillery observation device. On the inside, the turret ring is open, with an ammunition stowage rack for an estimated 12 rounds (based on a photograph). On the rear mudguards, a pair of ladders can be seen. They are probably not feet, as they appear rather flimsy. 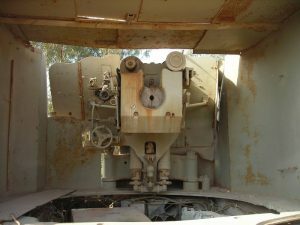 According to Armorama user “dhasset“, who was stationed in Iraq in 2007, the tank was found in a tank graveyard at near his Forward Operating Base at Diyala river valley. 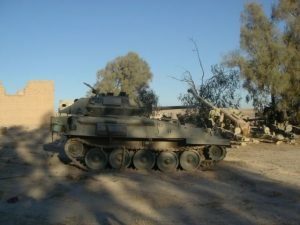 He took a series of roughly 16 photos of the tank and others in the same graveyard – This might be the Abu Sayda vehicle graveyard, but it is unclear whether or not this is the case. Side rear view. The small ladder-like structures on the mudguards are probably not feet, due to their flimsy design. In “Unheeded Warnings: The Lost Reports of the Congressional Task Force on Terrorism and Unconventional Warfare, Volume 2″, there is a short section which discusses Iraq’s use of artillery and field guns. Since 1988, the Iraqis had increased the quality and quantity of its missile and artillery forces via local production. Field guns and rockets were locally mobilized onto the T-54/T-55 chassis, including the M1943 160mm mortar, 4x 120mm MT-LB, 120mm D-30, 130mm M-46 or Type 59-1, and locally converted 155mm M-46s. 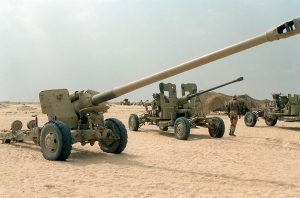 This was being done in response to lessons learned during the Iran-Iraq War, and due to Iraq’s preferred use of artillery – denial of enemy activity by fire. 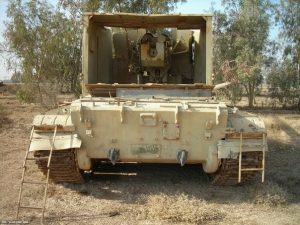 According to Iraqmilitary.org user “Hawkeye”, during the Iran-Iraq War, there was a need for SPGs with off-road capabilities, as a result of the lack of paved roads. 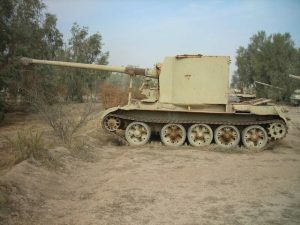 Iran was sold an unknown number of M1978 Koksans (based on the Type 59 chassis), and therefore, Iraq could have copied the concept of the Koksan with their T-55/130. This does not seem at all implausible. 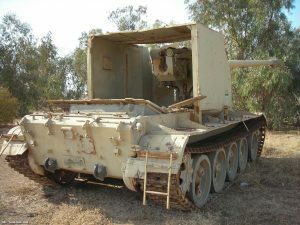 Interestingly, Iraq actually captured a Koksan during a Battle at Zubeidat, 12th July, 1988, along with 92 tanks, 120 artillery pieces, 60 APCs, and 448 other vehicles. 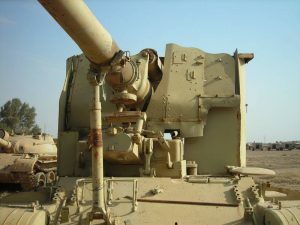 Not only this, but Iraq also procured foreign SPGs such as the GCT 155mm (85 of which were delivered between 1983 and 1985, some of which were mounted on T-72 chassis), among others, which could be seen in a vehicle graveyard at Camp Taji. These vehicles probably did not see service during the Gulf War or Iraq War. This being the case, it seems that the T-55/130 fits perfectly with Iraqi military doctrine, but if Iraq could procure foreign SPGs, it seems odd to build one for their own army. This being the case, the most plausible theory is that the vehicle was made by MEK (especially owing to the crude design) using a donated hull from the Iraqi army as a highly mobile, off-road-capable SPG. 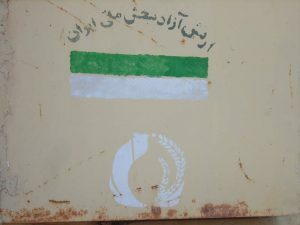 This is clear because unit marking seen on the side of the hull superstructure is written in Persian and appears slightly Marxist in nature – a calling card of MEK. Superstructure side closeup, the symbol appears to be that of MEK. If the vehicle saw any service, it was most likely during the final stages of the Iran-Iraq War – Operation Mersad. On 26th July 1988, Operation Mersad began with roughly 7000 MEK soldiers and 90,000 Iraqi soldiers taking part in the incursion into Iranian territory. There were an estimated 300 tanks that took part, too, but the Operation has been poorly documented. These were probably mostly with the main Iraqi forces. 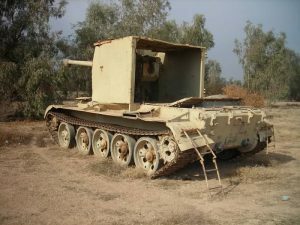 MEK was heavily armed, supplied, and covered by Iraq, but it is difficult to find any documentary proof of MEK operating tanks during that Operation, although they almost certainly did. There is clear evidence to suggest that MEK operated tanks at least after 1988. Although MEK renounced violence in 2001, after the coalition invasion of Iraq in 2003, the MEK compounds in Fallujah and Camp Ashraf in Diyala were raided by coalition forces and tanks were found at both. At the compound in Fallujah, 19 Chieftain tanks were found. Camp Ashraf was also home to a reported two thousand well-maintained tanks, APCs and field guns. That being the case, it is more than plausible that the tank could have been created anytime between the late Iran-Iraq War and 2001. One important dating feature is the amount of rust on the vehicle – this one was clearly not too well-maintained, not even by 2003. This puts the likely date of its creation and operation closer to the Iran-Iraq War. Since 2012, MEK is no longer considered a terrorist group by the USA. A rendition of the T-55/130 by Tanks Encyclopedia (click to enlarge). Front view of the T-55/130. A Scorpion can be seen in the background near the building. An Iranian Scorpion captured during the Iran-Iraq War, as seen in the background of the above. Other side view of the T-55/130. Rear. The vehicle also appears to have an Iraqi license plate. Interior details. Ammunition stowage can be seen to the below-right. The gunshield is clearly modified in that the right side has been cut to allow the gun to be offset. Close-up of the emblem on the side of the superstructure. The symbols indicate it belonged to MEK. 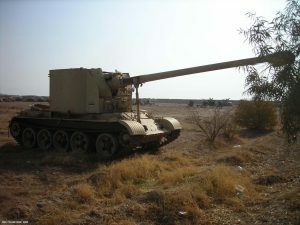 An Iraqi Type 59-1 field gun. The barrel and gun mechanisms appear identical to the ones on the T-55/130. The only exception is the gunshield, which appears to be the more common type on this example. Credits: Lance Cpl. Lanham, US Army, as taken from Wikipedia. Do you have any more pictures of this vehicle, I’m wanting to model it? My email is as below. After quite a bit of study of the pictures and assistance from on line sources I now firmly believe this to be a Czech T-55 hull, or possibly a T-54 upgraded to T-55 standards. The main pointers for this are the side opening engine inspection hatch; lack of wading rails around the air intakes; cut outs on the rear upper hull corners and oil filler caps on the final drive housings. The hull does retain some T-54 features, such as the enlarged hub on the first road wheel station and hull MG hole on the glacis plate – meaning it may have been an early T-55 retaining some of the T-54 features. As for the gun, the features match up very closely to the details in the Trumpeter Models Type 59-1 130mm gun model The fittings on the hull front top are primarily for the wheels (removed) and base plate (also removed), which have been folded upwards to rest underneath the gun. The small engine (?) fitted to the front of this area has also been removed here. Further to the right side gun shield being cut, The left side of the gun shield has also been cut down its length and welded back on in a more forwards position, as is evident from the rusty weld line visible in the inside pictures. Of interest, the gun cradle seems to be a car or truck drive shaft, cut to length – it still retains the universal joint fitting! Hi, we just found this page whilst investigating a very similar (identical?) 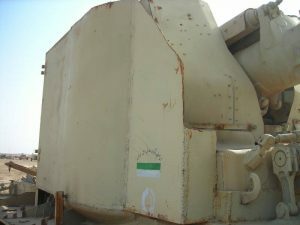 AFV a friend found near the Shatt-Al-Arab Hotel in Basra in 2003. It’s unlikely it was moved to Diyalla so likely there was more than one. Do you have any photos you could share?